(Newser) – Media access to the first family may be somewhat controlled in the US, but Ivanka Trump found such a buffer doesn't exist in Germany. Trump took the stage in Berlin on Tuesday at the W20 summit on women's entrepreneurship, at Chancellor Angela Merkel's invite, and she was quickly met with a hard-hitting question from the editor of a German business magazine about her simultaneous role as first daughter and assistant to her dad, as well as where her true loyalties are, Politico reports. "Who are you representing, your father as president of the [US], the American people, or your business?" 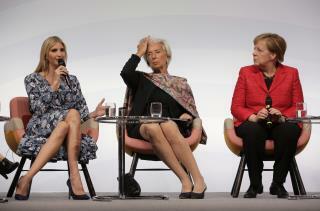 Miriam Meckel asked, adding Germans aren't in tune with what a "first daughter" does. "Certainly not the latter," Trump noted in reference to her business priorities, admitting she's also "rather unfamiliar" with her new role and that she's currently in "listening" and "learning" mode. Ivanka: "My father is a complete misogynist a-hole, and it's really annoying that people keep noticing."